An ulcer is defined as a break in the continuity of the lining epithelium of tissue. Once an ulcer appears, it's usually noticed by the patients, unless it's painless, or located at non-accessible sites. 1) When do you notice the ulcer? Remember that the ulcer might have been present for long before the patient actually notices it. This is usually in case of a neuropathic ulcer. 2) What draws your attention to the ulcer? Usually is because of pain. Others includes : bleeding, discharge, may be foul-smelling. 3) How does the ulcer disturbs you? 4) Any changes to the ulcer since you've noticed it? Is there any increase in size, changes in shape, increased discharge, bleeding, or severity of pain? 5) Is there any similar ulcers noticed elsewhere in the body? 6) What do you think is the cause of ulcer? Most of the time the patient will get it right, and the commonest cause is trauma. It means the rate of destruction of the subcutaneous tissue is more rapid than the skin, causing the edge of ulcer to be undermined. Classical example, as it's rarely seen nowadays is tuberculous ulcers. Ulcers with undermined edge is more commonly seen in bedsores, pressure sores as the subcutaneous tissues are more susceptible towards pressure. This means that over the edges of the ulcer, tissues are growing so rapid that it eventually overlaps the overlying skin. This is classically seen in Squamous cell carcinoma. The tissues over edges are growing slowly, which is usually pale/pink in colour, with telengiectasis seen over the pearly edges. 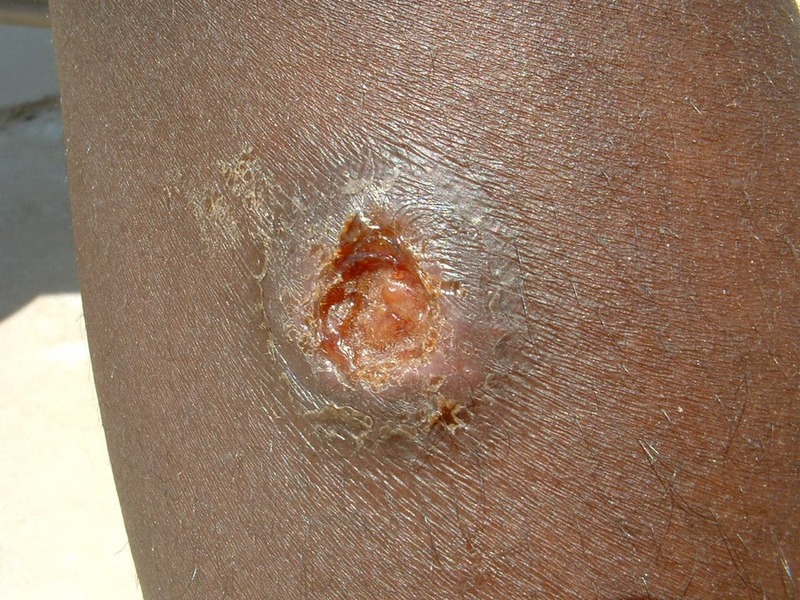 An ulcer with rolled edges is almost diagnostic of a rodent ulcer of Basal cell carcinoma. Discharge from an ulcer can be serous, serosanginous, sanginous, or purulent. Sometimes, due to the formation of a coagulation discharge scab over an ulcer, it prevents you from examining the entire structure of ulcer (might be missing some of it's features). It's advised that you remove the scab first. Feel the base of the ulcer. Please remember to palpate the regional lymph nodes. It'll be enlarged (and tender) if there's secondary metastatic deposits or any spreading infection. Most of the ulcers over the leg is due to poor vascular/nervous supply. Hence, it's a must that you check for it's vascularity and innervation.